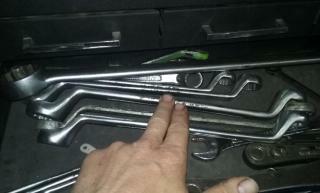 You're able to get the strut cap nut off that way? Yessir, have to move the bellowes up and reach through the spring with like an 8" pipe wrench. I was doing that long before I realized there was a tool. In fact the first time I changed the struts I took them out and in through the wheel well, lol. I remember thinking it was a ridiculous design but it never dawned on me to try to go straight up. There was a spring compressor involved and everything. To this day I still don't have the proper tool but at least I'm experienced enough to go up and out. On mine I don't even raise the car and pull the wheels with the pipe wrench method. 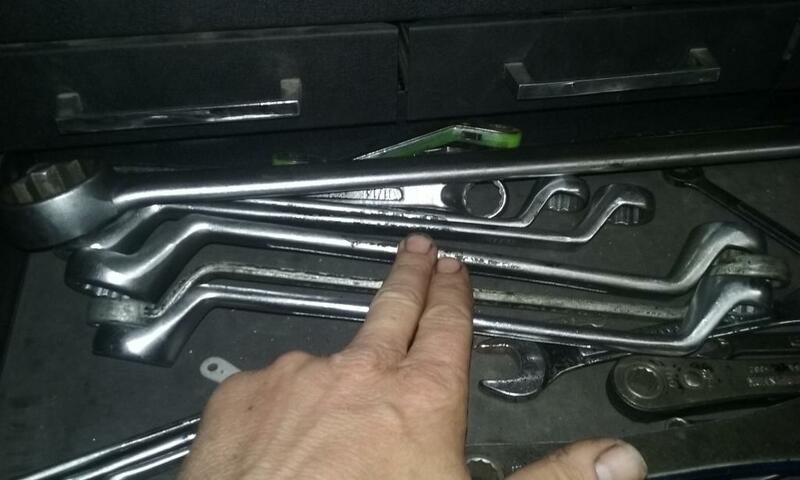 Still can't get it off... couldn't find an 60Âº offset box end wrench in 24mm or 15/16. 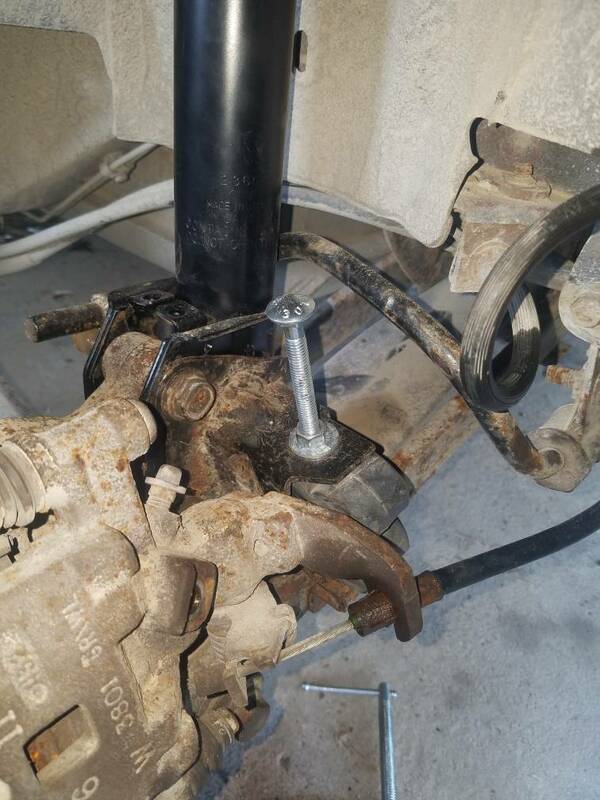 The lack of tools is getting expensive, I'll try an impact next to see if I can get the strut rod nut off, Before I have to buy the special strut nut offset socket. Anyone have some hints or tips with this kind of issue? Nothing specific on the others threads. Odd, my off the rack offset boxes worked on mine. Maybe I had a different size nut with my Gabriel struts. Can you weld? 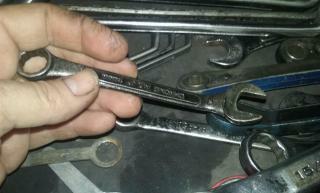 Maybe cut a china socket and weld it to a china box wrench? Maybe bore the square hole in a china socket out until it fits and hold it with vise grips? I used the impact to break the nut loose. Then I was able to get the wrench on it and unscrew with the T50 Torx. Worked like a charm, got them both in, in less than 45 min per side lol. Not bad for only doing this one time before, 5 years ago. I can't visualize it. Have any pictures? Pardon the messy metric combo wrench drawer, it's been a wild couple of weeks. I've never had a strut nut these couldn't hold. If you have access to a torch don't be afraid to modify a china wrench, they're like $10 a set. Just don't quench the wrench after bending and temper it, let it cool down to a normalish color before cooling it with water. I have no idea what I modified this one for but I'm guessing I won. 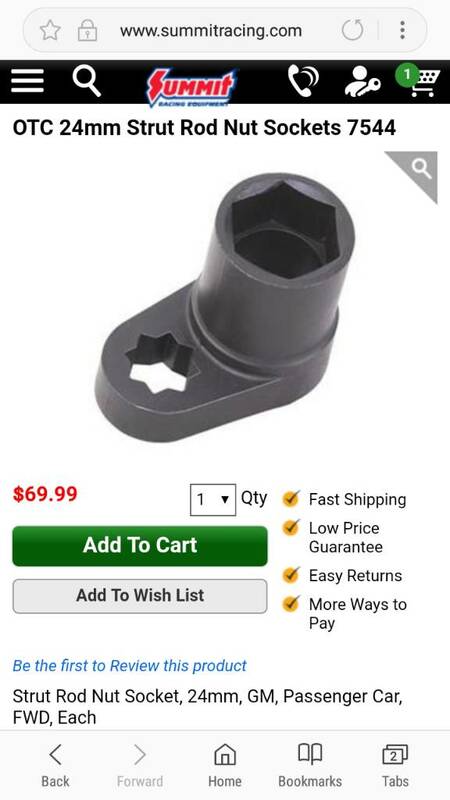 I was looking for a set like the first picture that would fit the 24mm nut, but all the wrench sets I seen were a size too small. 24mm = SAE 15/16", that's a size that's readily available and likely the reason 24mm is scarce. So doing the rear struts on the cutlass this weekend. 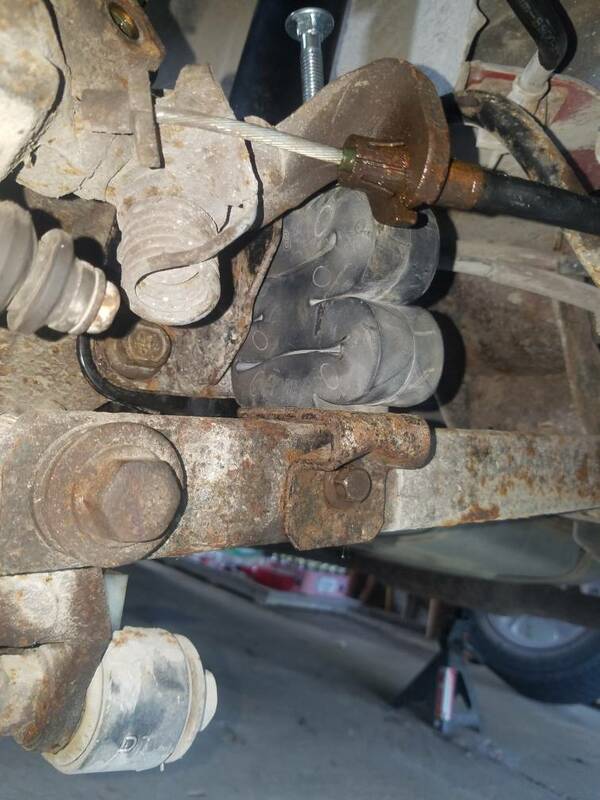 Took the drivers side out, but didn't realize what the rubber "number 8" looking thing was that was connected to the lateral link. Come to find out it's an auxiliary spring? Had to rake my brain on how to put it back in since for the life me I couldn't get it compressed (which there is an obsolete, more than likely unobtainable C-clamp device specifically for that spring). I came up with a carriage bolt, washer, and nut compressor to get it back in. Made it super easy for those who have taken out the Aux spring before keeping it compressed. And to add, I didn't want to leave it out if there is a specific job for that rubber spring, so I made sure to reinstall it! Here is the compressed aux spring that I was having troubles with. Mine were gone for years too. Have to imagine they would help a little with body roll. Seems like a drastic engineering decision to not have some kind of benefits. Are the rear wheels supposed to have positive camber to them? Mine looked much the same after replacing the rear struts..had to have a wheel alignment done to set things right. This. Get your alignment checked. 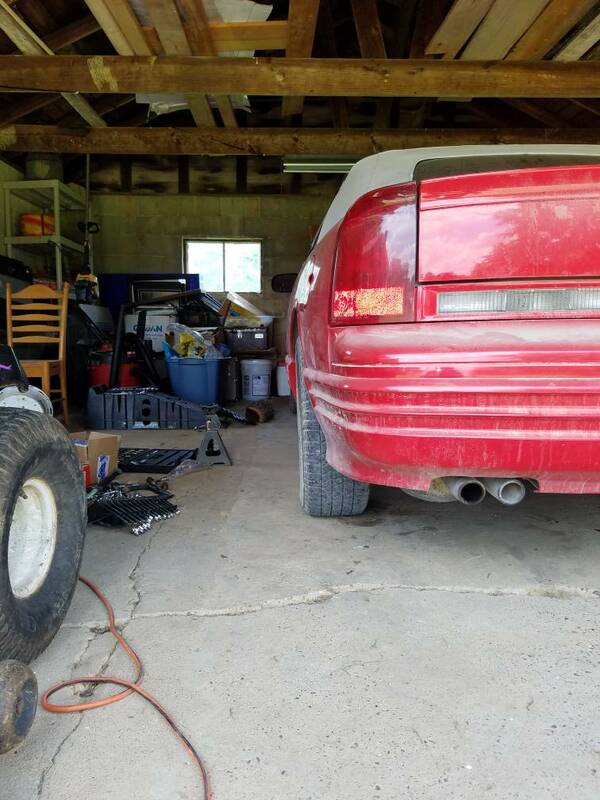 I plan on it, I need to do the ball joints and tie rods on the front. And off to the alignment specialist. Started sewing the top back together since over time the threads have disintegrated on both side, causing the cables to become visible. Working on my back stitch, so far I've got a 10" section done in about 2 hours time. This is gonna be the most time consuming project yet! Make sure there's enough slop in the strut to spindle bolts to allow for alignment or it'll come back just like that. I read that you're supposed to file out the bottom bolt on the spindle? Is that what you mean by slop? Yeah but file or dremel the strut, not the spindle. Try to pry it first though, there may be enough slop already but the spring influences it like that.